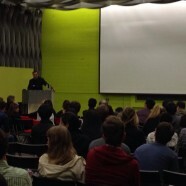 On the 18th of November, Zaha Hadid’s longtime partner gave a very interesting lecture at UCLA, Perloff Hall. The practice has been known for the paintings of Zaha Hadid even a decade ago. There was only a few construction sites of the architecture office. The Wolfsburg Volkswagen building in Germany was a great step among the BMW plant in 2000s for turning the spectacular and unique style of Zaha into a physicality. The One North Masterplan, science city in Singapore also proved the masterplan schemes are not destined to be an unbuilt cool vision. Patrik has shown astonishing construction photos of the complex concrete structures on site in the first half of the lecture which pleased the audience who came for the fest of pretty images. In the second part of hıs lecture, Patrik almost started another lecture on his personal architectural theory. The architectural theory of Patrik Schumacher is shaped under the roof of infamous architecture school of London, the Architectural Association. Being one of the directors of the Design Research Lab (AA-DRL) Patrik has been questioning the capacity of the parametric software plug-ins in order to create more intelligent forms that are responding to the demands for using the space more efficient. He talked about orientation, for example the curving walls guiding the user through his journey in the Building. The primitive symbology of buildings as a subject being not questioned and waiting to be evaluated by architects. The very academic approach of Patrik inevitably raises questions in our heads on how the running business partnership works in Zaha Hadid Architects. Even though Hadid comes from an academic background spending years teaching AA Diploma 9, taking over the unit master position from Rem Koolhaas and Elia Zanghelis, her approach has been challenged by the market economy by time limitation and competitive nature of the architecture business. She somehow manages to maintain the artistic, high technological quality of her buildings in a certain level. Having a partner like Patrik must help her not forget the academic ambitions that leads to great architecture merging with the aesthetics of her design. Patrik highlighted for at least a few times the great importance of networking for the leading architects, architecture schools and the rest of the industry. He warned the architects for the danger of staying disconnected therefore losing the path to discover new ways of design that can make the profession a lot more interesting in the future.